A strong contender for the most obviously ridiculous etymology in Jeffery's The Foreign Vocabulary of The Quran is his attempt to derive yaqṭīn "gourd" from a "garbled form" of Hebrew qîqāyôn (p. 309). Is it possible to do better? aɣ a nɣa lyaʕḍud, I eat Launaea. واليقطين: كل ما ينسدح على وجه الأرض ولا يقوم على ساق كشجر البطيخ والقثاء والحنظل، وهو يفعيل من قطن بالمكان إذا قام به. وقيل هو: الدباء. Yaqṭīn is anything that sprawls on the surface of the earth and does not stand on a stalk, like the melon and the snake cucumber and the colocynth. It is (of the form) yaCCīC, from qṭn, "it dwells/settles" in a place if it comes up there. It is also said to be the gourd. However, the fact that Arabic has only three words of this form - two of them plant names, and one related to honey extraction - should arouse our suspicions. If a language has a small class of morphologically anomalous nouns all relating to wild food-gathering activities, the hypothesis that should immediately spring to mind is: this is substratum vocabulary. In other words, these three words - especially yaqṭīn and yaʕḍīd - should be suspected of being borrowings, not from some garbled Hebrew source, but from the indigenous Semitic languages spoken in the Arabian peninsula before the spread of Arabic. If so, Western Qur'ān studies' excessive focus on written sources seems more likely to obscure linguistic history than to reveal it. The Qur'ān is not intended as an account of events. Rather than being organised around narratives, it typically brings up apparently familiar narratives in support of points being made. Yūnus/Jonah, for example, is mentioned by name 4 times, and by epithet another 2 times. Two of these mentions give no details of his story at all (4:163, 6:86). 10:98, 21:87-88, and 67:48-49 only briefly summarise specific aspects of the story. 37:139-148 recounts the story as a whole, but in such an abbreviated form as to presuppose that at least part of the audience had already heard a fuller version. Can anything about that version be determined from the text of the Qur'ān? Hapaxes - words that occur very rarely or only once in the text - offer an interesting window on the problem (see also previous posts: ضريع, قسورة). Apart from the name Yūnus (Jonah) itself, four words are attested in the Qur'ān only within accounts of Jonah. The oldest attested form of his name is Yônāh, which in Greek yields Iônas (ιωνας) in the nominative (the -s is a widespread Indo-European nominative singular suffix); the final s in Yūnus thus suggests that the audience's knowledge of Jonah came in part via Greek intermediaries at some remove. 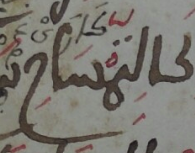 "Fish" is normally ḥūt حوت in the Qur'ān, including in accounts of Jonah (Standard Arabic samak سمك is unattested in the text), but in 21:87 Jonah is alluded to as ḏā n-nūn ذا النون "he of the fish", the only occurrence in the Qur'ān of the Aramaic loanword nūn. The fish swallowed (iltaqamat التقمت) Jonah in 37:142; the only other mention of swallowing in the Qur'ān uses a word much better attested in modern Arabic dialects, balaʕa بلع (11:44:3). After praying to God for release, he is then cast out onto the shore, for which both 37:145 and 68:49 use the more specific term ʕarā' عراء, ie barren land. Eventually God causes a gourd - yaqṭīn يقطين - to grow over his head; this is the only Qur'ānic mention of the plant in question. Jonah fish swallow land sp. plant sp. One immediately notices that none of them match the Qur'ān as a whole at all well. For "Jonah", only Geez (Ethiopic) offers a similar Greek-influenced term, contrasting with the obvious Aramaic source of nūn for "fish". For "swallow", the Hebrew and Aramaic/Syriac versions all use a word whose direct cognate - balaʕa - is attested elsewhere in the Qur'ān, and is very familiar in Arabic; why then does the more vivid term iltaqama (something like "take in as a morsel") appear? For the land onto which Jonah is cast, the Qur'ān twice uses a specific term incorporating a detail absent from any of these versions of the Book of Jonah, all of which use a generic term for "dry land" or even just "land"; why is this used rather than 'arḍ or even the cognate yābisah? The conclusion seems obvious: none of these translations were at all prominent for the Arab audience to whom the Qur'ān was first addressed. Whatever its distant roots may have been, the account of Jonah they knew best was something orally transmitted in Arabic, and not directly based on any one of these. fatta: a loan from Chadic into Songhay? The Proto-Chadic word for "go out" was reconstructed by Newman and Ma (1966) as *p-t-, with attested reflexes in all primary subgroups of the family; the best known of these is of course (West Chadic A.1) Hausa fìtā. The vowels vary across languages, and there is often no final vowel. Only one subgroup, as far as I can see on a quick check, shows the consistent vocalisation *patā: the Bole languages (West Chadic A.2), spoken in Nigeria's Yobe State along the boundary between Hausa and Kanuri. Thus Bole pàtā, Ngamo hàtâ, Karekare fàtā. Most Songhay varieties have reflexes of two near-synonyms for "go out": *hùnú and *fáttá. Usually, the distinction seems to be roughly "leave (a place or event)" vs. "go out of (an enclosed or concealed space)". In Northern Songhay - the subgroup most isolated from the rest for longest, spoken in the Sahara - only reflexes of *hùnú seem to be attested, covering both senses (eg Korandje hnu). This could be interpreted as reflecting Northern Songhay's general tendency to reduce its inherited vocabulary by widening the usage of generic terms. In light of the Chadic data, however, it is tempting to interpret it the other way around: did Northern Songhay preserve the original situation, while a West Chadic borrowing spread throughout the rest of the family via the Niger River? Djenne, in central Mali, is one of the oldest cities in West Africa; it also happens to be the westernmost Songhay-speaking town, isolated in a predominantly Bozo area. As an old regional centre of Islamic learning, it has rather a lot of manuscripts, most still in the hands of local families rather than taken over by official heritage-keepers. 56 family collections of manuscripts in Djenne have recently been digitised and made available online, at the Djenne Manuscript Library Collection. Searching through this amazing resource is a bit of an adventure, since a lot got lost in the translation of the metadata (for instance, this manuscript labelled as Intercession is actually a list of tribe names). But doing so has potential rewards for the historical linguist as well as for the historian: scattered through the manuscripts are very occasional marginalia in local languages. The first examples I've managed to find come from a late 19th or early 20th century manuscript of 8 pages, belonging to the family of Alphamoye Baber Djenepo, to which the cataloguers gave the title مكتوب في اللغة "writing on language" (which, after passing through a layer or two of translation, ended up in English as "Philology"). It's an obviously incomplete part of an alphabetical poem (unknown to Google) recounting the life of the Prophet, which gives for each letter of the Arabic alphabet in order a section rhyming in that letter. The language is somewhat obscure, and is copiously annotated - mainly in Arabic, but every so often in Songhay. This particular example is too recent to contribute much to Songhay philology, but it at least proves that Songhay was used to gloss manuscripts in Djenne, and suggests that it would be worth looking through the collection for other examples. Almost every attested Songhay variety (Tasawaq is perhaps the only exception) has a reflex of the proto-Songhay word *gúrú "draw water" (from the river, from a pond, from a well, etc.) To express this concept, most Berber varieties (including Tashelhiyt, Kabyle, Tumzabt, Ghadames, Awjila, Tamajeq...) use reflexes of a verb *āgum "draw water", which is thus equally securely reconstructible for proto-Berber. Zenaga, however, has a rather different verb: ägur "puiser l'eau d'un puits, remonter le delou, tirer la corde du seau; faire parvenir qqc (à qqn)" and "se lever (astre)", with an irregular corresponding noun tgäʔrih "eau tirée du puits". It seems to be distinct from äggur "pull". If the Zenaga word is indeed cognate to the suggested Berber forms, then it seems reasonable to draw the conclusion that proto-Songhay borrowed *gúrú "draw water" from an early relative of Zenaga. This would fit well with the evidence for a Western Berber language having played an important role in the history of at least northern Mali. If not, then it would become tempting to draw a conclusion much harder to fit with what is known of the region's history: that Zenaga borrowed the word from proto-Songhay.